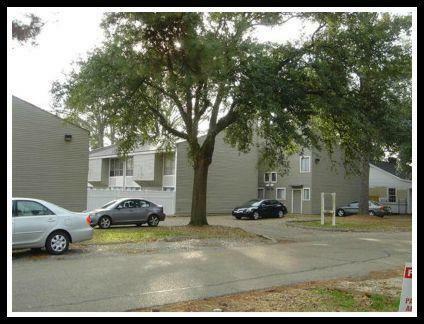 Patiohouse 1 Apartments are conveniently located in the popular Capital Heights neighborhood in Baton Rouge's Mid-City district. Each apartment features 800 square feet of living area in a two-story floor plan. The upstairs has one bedroom with twin closets, a full bathroom and an additional loft area with a closet which makes an ideal office, study or even a second bedroom. Some floorplans have Washer/Dryer in the loft closet. Downstairs has an all electric kitchen with stove range and oven, exhaust hood, dishwasher, refrigerator and lots of counter space and cabinets. An attached breakfast area leads to the living room which has a coat closet and a sliding glass door opening to the private patio. Central air and heat keep our apartments comfortable year-round. All apartments are cable ready and laundry facilities are on site. Rent includes sewer, water, pest control service, termite service, dumpster service and appliance and mechanical maintenance. Vacant apartments undergo a thorough inspection and are painted, cleaned and carpets are steam cleaned before a new tenant moves in. Pets are not allowed and Section-8 rental agreements are not accepted. Strict screening guidelines, excellent facilities maintenance and 24-hour video security promote a safe home in a safe neighborhood. Please call our office today at 225-927-1982 for more information and to arrange your private tour! Pet Policy: Small dogs & cats, under 30 lbs. (with restrictions) are allowed with additional $1,000.00 pet deposit. Available Now! $850 with Washer/Dryer! Next Available: *4/12, 5/10, $850 each with Washer/Dryer! Call 225-927-1982 for more information!